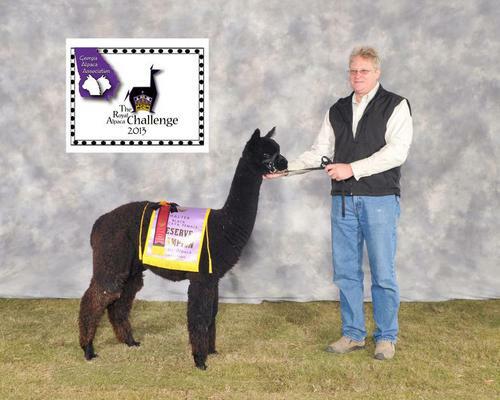 The catalog below is just a sampling of the world class alpacas we have available for sale. Additionally, we have yearlings and new cria arriving each year that are usually not listed until after their show careers. Contact us to receive an email with info regarding the full herd listing. We can also schedule a time for you to come by to get a closer look at these beauties. Financing available: We offer up to 1 year NO INTEREST with 25% down on purchases over 2k, and up to 2 years NO INTEREST with 25% down on purchases over 10k. As-of Jan. 2017, Snowstorm offspring took home a halter class banner from the AOA/AOBA National Show 3 out of the last 4 years, and brought home 1st place halter ribbons from the AOA/AOBA National Show 5 out of the last 6 years. In addition to being a multi-champion himself... Snowstorm's offspring have received 30 banners and over 100 1st & 2nd place ribbons. His ability to endow offspring with excellent conformation and advanced fleece traits has been validated in the showring, with offspring receiving many color champion & judges choice awards. From his first cria to the most recent one who was awarded Color Champion in both AOA National Halter & Fleece shows in 2016. "Fineness, crimp, density, uniformity, coverage, excellent conformation, and a beautiful head. 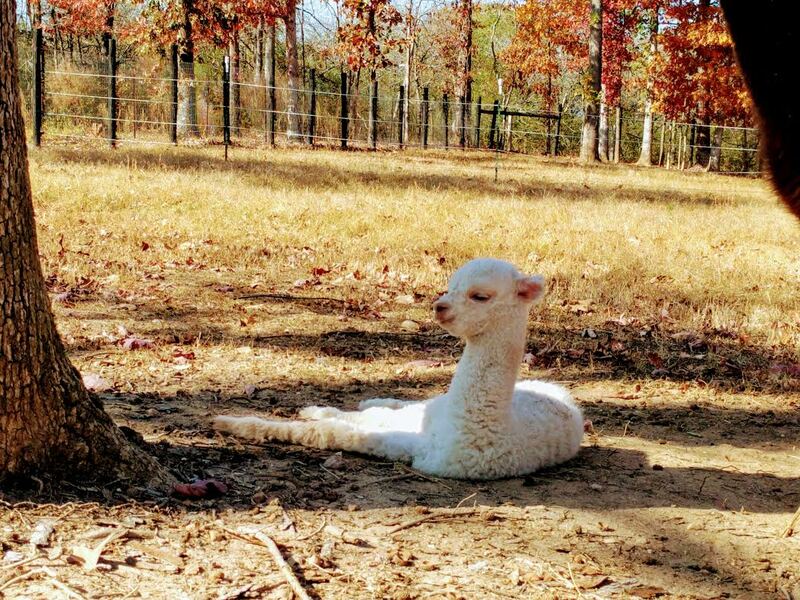 This alpaca is the TOTAL PACKAGE." Those were the words of Dr. Julio Sumar (Peru) when he was awarding Snowstorm his first blue ribbon. 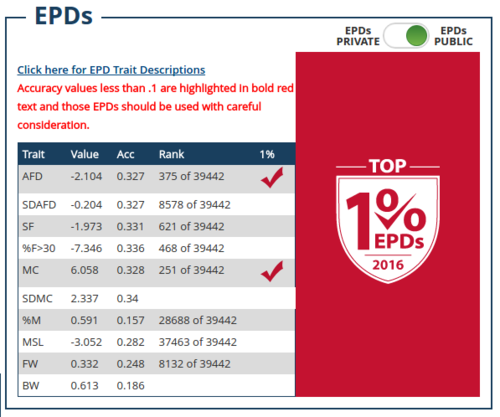 If you're looking for more objective data, check out his EPDs. Of standing studs that have Color Championships in a halter class, Snowstorm has the highest published EPDs for improving fineness, and also the highest for curvature. While individual traits are important, we breed for a combination of traits. 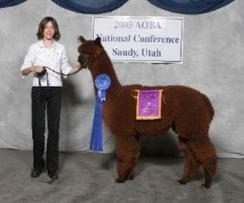 Snowstorm is the top male for improving fineness, curvature, and fleece weight of standing studs with halter banners. (based on 2016 EPDs - top 20 AFD sorted by MC - Snowstorm is #1, and has the highest AFW of halter champions).Snowstorm had an 18 micron fleece in year 1, and only a 20.3 micron fleece in year 6. At 15 years old he had a 21 micron AFD on his 2018 histogram. That's the kind of lingering fineness everyone should be breeding for. His first year histograms were taken at shoulder, mid-side, and hip. The AFD scores were all between 18.0 and 18.4 micron, showing amazing uniformity. Not only is he fine and consistent, but he shears over 10 lbs of fine, uniform fleece.Snowstorm is a grandson of SNOWMASTER who was sold to a farm in Australia for $250,000 and then imported back to Peru because of his incredible genetics. There are very few male offspring in this country to carry on his incredible genetics. Snowstorm is one of them.By any measure he is an impressive and unique herdsire. Based on EPDs, progeny, pedigree, and measurable traits, we know he'll improve the offspring of just about any female. For more information, visit this page Eastwind's Snowstorm. Stratosphere did it again! Denali gave birth this year to a truly spectacular maroon boy with HERDSIRE written all over him! (If you are looking for that EXTRA SPECIAL male to show and breed, you HAVE to see him! )And last year, Denali gave birth to an absolutley incredible True Black Stratosphere Daughter. Championed! Shouldn't have been a surprise... he's done it many times before!We were so pleased with Denali and Stratosphere's AWESOME cria, that we rebred her to Strat! And wholly cow, she had a gorgeous boy! We have decided to breed her to Strat's incredible son, Night Sky Magic.Denali is a magnificent daughter of VICTOR'S VIC JR., and a grand daughter of PERUVIAN HEMINGWAY.There just aren't enough superlatives to adequately describe this gem. She has every superior quality you could ask for in an alpaca. Her conformation is impeccable, and her mahogany fleece is exquisite (her first fleece was 15.9 microns! ).Denali has only been shown four times, and she brought home 4 Blue Ribbons, 1 Reserve Champion Ribbon, and 3 Color Champion Banners, including First Place and Color Champion at AOBA nationals 2005. She is the most highly decorated female in our herd!Denali has had two spectacular cria by EASTWIND'S SNOWSTORM, our White Champion grandson of SNOWMASTER. Their cria are spectacular. 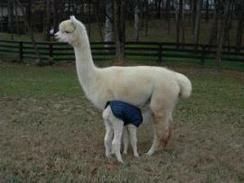 Denali gave birth to a wonderful little girl, Denali's Lovey Dovey. Then, she graced us with an incredible True Black Stratosphere Daughter, McKinlee! A CHAMPION!Denali is proudly co-owned with Cheryl and Albert Laufer of Spirit Wind Alpacas of Turning Point Farm. As an impressive, nationally recognized, elite herdsire, Apocalypse has proven himself with an almost unmatched record spanning not only recognized and proven EPDs, but show winnings, and progeny that follow in his footsteps. HOW DOES APOCALYPSE FIT YOUR BREEDING PROGRAM? Some focus on pedigree and show winnings. Apocalypse is a national champion. Both his elite fleece and perfect conformation have been validated in the show ring, placing above herdsires like Snowmass Matrix (2004 Futurity). Apocalypse is son of Accoyo America Nautilus, and big brother to herdsires like Mahatma and Road Warrior. His elite genetics are built on the foundation of Hemingway and Accoyo Sicuani, with a 3/4 Accoyo and 1/4 Hemingway pedigree.Some focus on histograms. Apocalypse had a 15.2 micron fleece in year 1, and only a 21.5 micron fleece in year 8. In 2018, at 15 years old he had a 22.5 micron fleece. That's the kind of lingering fineness everyone should be breeding for.Some focus on progeny testing. Apocalypse is not only a multiple champion, but he has sired champion offspring. He has over 70 offspring, with an average AFD of 19.5 at 6 years. A couple years ago, Apocalypse offspring made up 25% of the top 100 male and female EPDs sorted by AFD and AFW. In 2015, 4 Apocalypse sons are ranked in the top 50 EPD Huacaya males for fineness.Livestock Breeding Experts Recommend EPDs. Experts will tell you that when breeding for genetic improvement, the most predictable improvement is achieved through study of EPDs that evaluate genetics in ancestors, siblings, and offspring while statistically eliminating the environmental factors. Apocalypse is in the top 2% for fineness, spin fineness, and curvature. He's in the top 3% for %>30, top 4% for standard deviation, and top 7% for FW (which is awesome given his top ranking AFD). While individual traits are important, we breed for a combination of traits. Apocalypse is one of the top 10 herdsires, East of the Mississippi, for fineness and density as proven by EPDs (based on top 150 AFD, sorted by AFW). Angie is not only beautiful with very dense fleece, tight fiber, and a consistent crimp, but she is also loaded with top bloodlines. She is out of two multi champions, Forest Ladies Denali and Eastwind’s Snowstorm. She carries a giant frame inherited from her dad, and the ability to pass color was passed down from both parents. Her dam is a medium brown and when Angie was bred to Snowmass Bronze Dawn, she produced a gorgeous true black female cria. We're excited to see the quality of colors she can produce with top EPDs, a show winning pedigree, and a VERY large frame. As a mom, she has excellent maternal instincts, milk production, and easy births. Both her parents were champions with excellent conformation and Angie passes that same excellent conformation to her offspring. Our SemiHemi™ breeding program strives to carry on the vision of great Peruvian alpaca breeders, while utilizing modern tools to accelerate that effort. We are continually importing the best genetics from around the country to improve not only our herd but to also impact herds throughout the Southeast. As a result, our herd carries solid conformation and bone structure, elite fleece characteristics, lingering fineness, and improved alpaca traits. 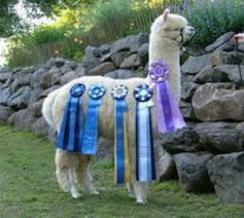 Those championship pedigrees are validated not only in the show ring but also through scientific testing. 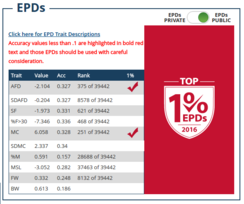 Our 'herd average" for AFD EPDs, places our herd solidly in the top 10% of all alpacas nationwide while we regularly have individuals listed in the top 1%.